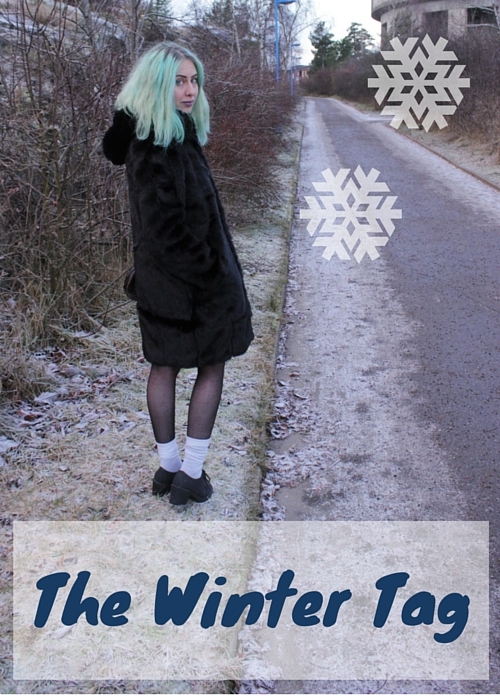 I’ve never done a tag post before, but when I saw The Winter Tag over at beautifulbreakables place I thought it could be a fun thing to do. If you also think it would be fun, consider your self tagged by me. And tweet me the link if you decide to do it, okay? The crisp air. I love that. And winter accessories, hats, knee-high socks and big scarfs are a favorite too. And when it’s snowing mittens, when everything gets fluffy and white and silent. Both. Beanies looks great but scarves are so cozy and warm, so I just can’t decide. Anything dark. Dark red, dark green, dark blue, dark purple and black. And maybe some glitter on top of that. Hot chocolate of course. With whipped cream and sprinkles. A warm coat, warm knee-high socks and lots of candles. I don’t have one. We bought cats and that’s all I wanted. But if I had a wish list this year bath bombs from Lush would be on top of it. Change all the time but right now I’m loving Hurraw Lip Balm. And dark lipsticks. It will probably be my new tinsel sweater from H&M with a dress underneath it. Hope you liked my post. And let me know if you plan to do the tag. ← Caturday #2. An Update. Tags are awesome! I’m considering myself tagged! Lovely tag entry!